Wildlife X Team can help you to get those crafty raccoons out of your attic!. Battling raccoons in your attic and around your home may seem like a never-ending struggle. We offer affordable, effective, and humane raccoon removal service for clients that are pestered from these pests. Wildlife X Team follows humane practices so you never need to feel guilty when we relocate the animals. It restores the balance between humans and the animals. When you don’t know how to get rid of your unwelcome furry guests, turn to our company for raccoon trapping. We beat the price of every competitor by 10% and care about client satisfaction. Expect immediate service and thorough removal when you schedule raccoon removal in San Antonio, TX. Are you tired of walking outside every morning and seeing the mess that raccoons have caused around your trashcan? Do you hear a raccoon family running around in your attic or crawlspace? Raccoons have a well-deserved reputation for making trouble. They are smart animals that are known to get into everything no matter how hard humans try to keep them out. These animals are intelligent enough to get around standard traps and enter your property through even the smallest openings. Once they get into your home and are sheltered from weather and colder temperatures, they will set about making themselves comfortable nests. Pregnant raccoons may find your attic to be the perfect nesting place. The insulation is a secure, snug place for them to give birth to as many as seven babies in one litter. Since raccoons are nocturnal animals, they can be hard to find under the cover of night. We understand their habits and know where to find them when they are sleeping during the day. For us, the first step in raccoon control is to identify where they live. Our technicians use the skills they have gathered over more than 20 years in the business to locate, capture, and remove any animal visitors. 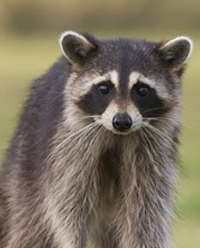 Raccoons are one of the most prevalent carriers of rabies. Aggressive behavior is a common sign of rabies in raccoons. In fact, a rabid raccoon can possess a level of strength and boldness that may surprise you. The majority of raccoon’s do not carry rabies, but you should not put your own health and safety at risk. Raccoon trapping is a safe course of action for the animal and you. If you suspect you have a raccoon on your property, do not approach it. Contact us to determine the best course of action. We do not advise homeowners to go it alone when it comes to raccoon removal. You never know if a mother raccoon will bite you if she feels threatened. Our humane raccoon removal service is focused on safely removing raccoons and relocating them to another location away from human interaction. If the raccoon has a family, we do our best to transport and keep them together. Contact us to schedule an appointment for raccoon removal services with our humane animal trapping team. We serve clients in San Antonio, TX, and the surrounding communities.